Christmas time is here again and you’ve been charged with bringing dessert. Try something exciting with this festive Christmas cake recipe. 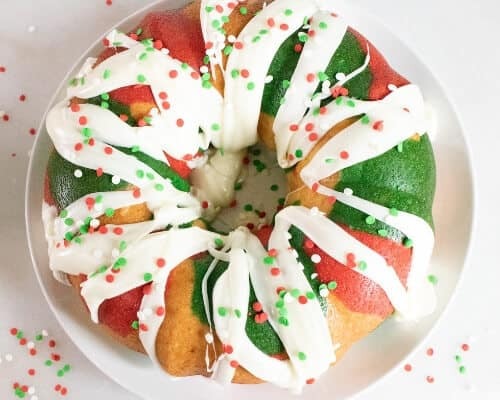 Turn this easy vanilla bundt cake recipe into a fun and festive tie dye Christmas wreath bundt cake. Add a little frosting and sprinkles to jazz it up and it will be a hit at any Christmas party. 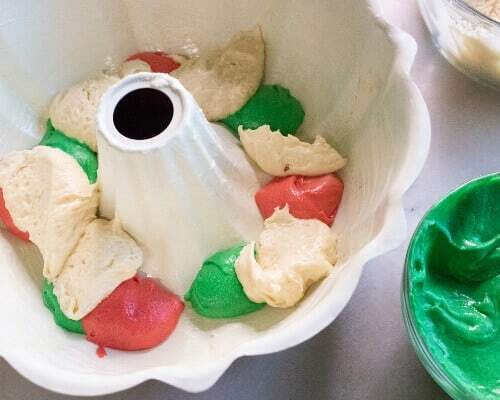 It’s an easy Christmas dessert to make but screams holiday fun with it’s red and green pattern. This recipe is made from scratch but you could easily make it with boxed cake mix as well by skipping down the recipe a bit. This recipe is made with ingredients you probably already have in your cupboard! 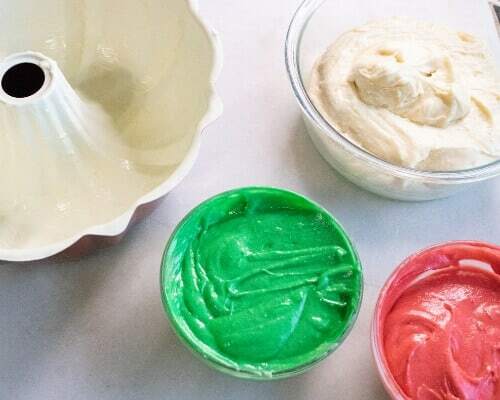 Just make sure you have a nice bundt pan and some red and green gel food coloring before you get started. Make sure to grease the pan really well so that your cake doesn’t stick when it’s time to take it out. Divide batter into 3 bowls, with 1/3 going into each bowl. Add gel food coloring to 2 of the bowls: green and red. Top with a frosting or glaze and sprinkles, if desired. You could also dust it with powdered sugar to create a beautiful snow like look on top. Isn’t it cute?! It will look like you made a super complicated dessert but it’s actually easy and simple to make this Christmas bundt cake. It’s sure to impress. I can’t wait to make it for a Christmas party dessert this year. If you’re looking for more fun holiday desserts check out these Penguin Brownies or these kid-friendly Rice Krispie Snowmen.